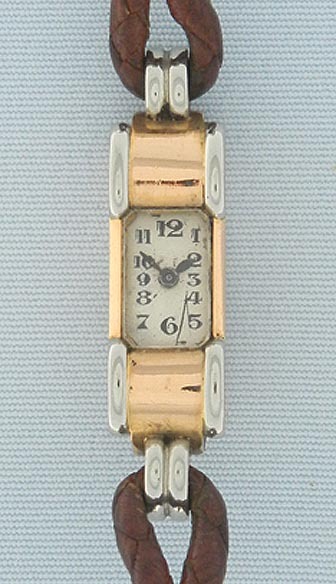 Fine and elegant yellow and white Art Deco 18K gold ladies Gubelin vintage backwind wrist watch, possibly by Audemar Piguet, circa 1920. Original silver dial with blackmarkings and blued steel hands. Signed Gubelin on the movement and case inside. Distinctive two-color case with gold fittings on the braided leather band.